We woke up to a freezing cold Chicago day. We were still used to the temps in Atlanta which were hovering at 80 degrees at the time. Waking up to a day in the 30's was shocking. We rallied though, and managed to plan a super fun day. Our new friends that we had met at happy hour the previous day told us about this fun even Chicago was hosting all weekend. They explained to us that there were all sorts of exclusive sites around the city that aren't generally open to the public, and for one weekend Chicago Architecture Foundation hosts an event called Open House Chicago where anyone can get free access. From hidden bank vaults to exclusive members only roof tops to secret club lounges, we couldn't resist the temptation to check it all out. We didn't see the event widely advertised, but once we knew what to look for, we realized just how many spots were located around the city to check out. This made for an easy way for us to see a lot of interesting sites before I had to make my flight later that afternoon. There were so many intriguing places open to see, and we wish we had learned about it sooner. However, we looked at the maps and circled what sounded the most interesting and did our best to hit up as many as we could. First up was the Money Museum located in the Federal Reserve Bank of Chicago. This was one of the most interesting tours I have ever taken. It was one of the more guided tours we participated in with the OHC, and it was well worth it. If you ever get the chance, definitely stop by. I won't spoil some of the more shocking facts we learned, but we learned some crazy facts about money while we were there. Not to mention we were able to partake in a lot of interactive exhibits. For those with kids on the tour, this for sure had to be a highlight. We were able to see what a million one dollar bills looked like. We were able to learn how to spot fake money and learn the shocking statistic about how much counterfeit money is pulled for U.S. banks each day (it is a seriously staggering amount!). And we were even able to take home some shredded money as a parting gift. The Money Museum also had a wondrous amount of money related artifacts and historical dollars and coins on site. It was so neat to see how money has changed over the course of history. Especially U.S. money. Needless to say we were impressed. Next stop was the current Wintrust Bank Building. This historic building used to host one of the first big banks of Chicago. On the tour you were given an exclusive peek into their vault, a look into their gorgeous ballrooms, and access to their members only roof top. It was super cold up there, and I didn't dare get close to the edge or look down. We were pretty high up and to give you perspective the tallest building to the right in this photo is the Willis Tower. Looking over the edge wasn't going to happen. We did a few more tours, but one of our favorite was the visit to Chicago's City Hall. The building has a ton of history to it, and so many neat places to look. The halls were so fun because they were lined with the infamous "W" flags and donning red lights. Chicago was in the World Series and the entire city was EXCITED. Everywhere you turned they were "flying the W". As huge baseball fans, we loved seeing how the city showed mad amounts of support for its home team. I loved this mural. This was created by an architect of the city. This is kind of an outline for how he envisioned the city's skyline to look. It's amazing to see how many of the buildings actually came to life, and to see which ones never made the cut. Then we were able to take a tour of City Hall's most famous room, and learn about the different history that has gone down in that space as well as pretend for a minute we were the mayor of the city. They wouldn't let me make too many official orders, but I won't hold that against them. It was still such an interesting part of the tour. We took in another site or two, but by this time we were hungry. I couldn't leave Chicago without one last little taste of their pizza. We cabbed it over to Uno's pizza, and oh my was it so so yummy! Their claim is they are the inventors of the original deep dish pizza. All I can say is they definitely know what they are doing! They have a ton of locations now through out the U.S. (side note: Can someone open a location in Atlanta? Please and thank you! ), but this is the original location from the 1930's. I loved the atmosphere and the pizza was out of this world. It was definitely one of my favorites on the entire trip. So much yum! After we ate our weight in pizza, we did a little more walking and just lounged in the hotel room for a bit to relax before it was time for me to head home, and leave Mr. Cute to enjoy the city for four more days. 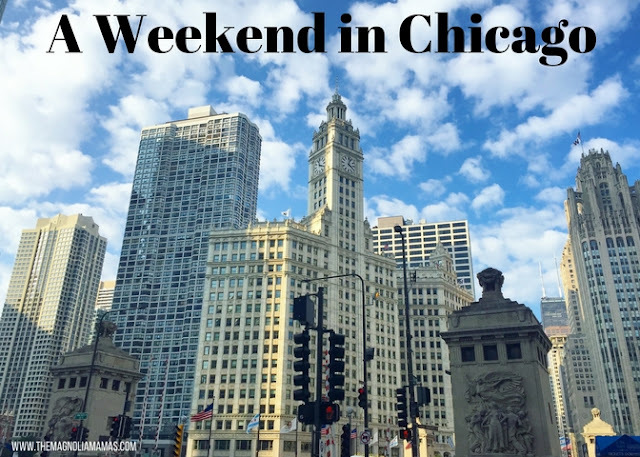 I loved our little weekend in Chicago, and am already looking forward to when we can visit again soon!